ttsandra | navigating beauty & personal style - Cleansin' Wednesday! Hi. My name is Sandra and I am a skincare fanatic. I currently have over 10 cleansers on rotation… Oops. While I am a firm believer of owning at least two different cleansers catering to your skin concerns, how I have accumulated 10 in the recent months is beyond me. Cleansing is one of the most essential steps in skincare. If I don’t wash my face properly, I wake up to dull skin and at least one volcano on my face. I like to call them "Steves". We don’t like Steve (sorry, Steves around the world). I hope that my cleansing trials and tribulations can at least help you out next time you’re browsing the shelves for something new to try. My skin type is combination/oily. Prone to breakouts. I am not super sensitive when it comes to active ingredients, but I have had some episodes of redness, dryness and sensitivity in the winter. What I love about it: it effectively cleanses my skin without making it feel tight or red, it has no fragrance, parabens or sulfates, and it removes makeup like a dream when used in conjunction with a warm washcloth. If you have oily skin that is prone to pore congestion and is known to be sensitive, I cannot recommend this enough. I think the brand is now pretty widely available at most drug stores that have a premium/French pharmacy skincare section, at Ulta in the USA. You can also order online from Amazon. 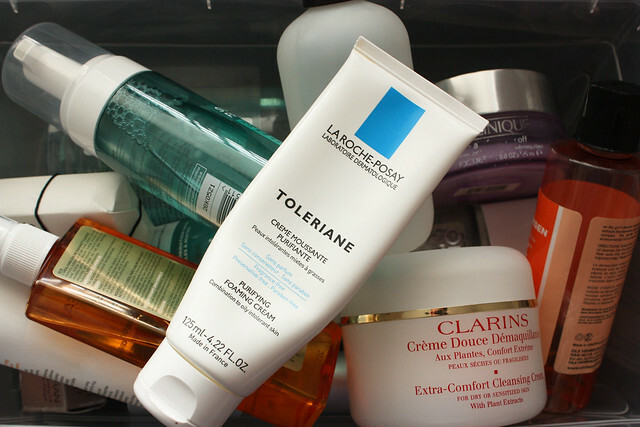 If your skin type is more normal/dry, you can try other offerings from the brilliant Toleriane range – they have a cleansing milk, cream and gel available. I’ll see you next week with a new cleanser. I hope you will enjoy this segment. Your friendly neighbourhood skincare hoarder. Clarins Extra-Comfort Cleansing Cream came highly recommended by a few people so I bought this in the middle of the polar vortex this past winter.